Last August, Ashley, our book’s editor introduced Extreme Cakeovers, along with her other upcoming book projects to the rest of the staff at Clarkson Potter, during their Summer 2013 Cookbook Launch. Their cookbook launches happen three times a year and is a chance for all the editors to present the books roughly a year in advance of publication and authors to start to get excited about their book’s release! Aside from our publishing team becoming more familiar with Extreme Cakeovers, we could finally publicly share the book we had been working on for more than a year! The Launch happened during a hectic and exciting month for us. The week of the launch we were fully booked with cakes at cakelava, had family visiting, and preparing for classes Rick was teaching. We had to be on a plane at the end of the week! The cookbook launch presentations were full of surprises and not just for the staff at Clarkson Potter, but also for us. We didn’t know Ashley would be making one of the book’s recipes until we saw the photos of her amazing Jukebox cake she shared with her colleagues at the launch. Our jaws literally dropped when we saw the Jukebox! We were really impressed with her piping skills and she had everything in the right place. She had also made a brilliant substitution for the large Tootsie Rolls for the bottom of the Jukebox, demonstrating what we would want any reader to do – use products that are most convenient to them to carry out the design. 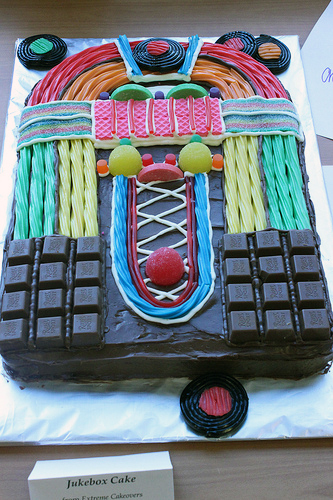 our favorite being of course, Ashley’s Jukebox cake! You can read all about the Clarkson Potter Summer 2013 Cookbook Launch here. 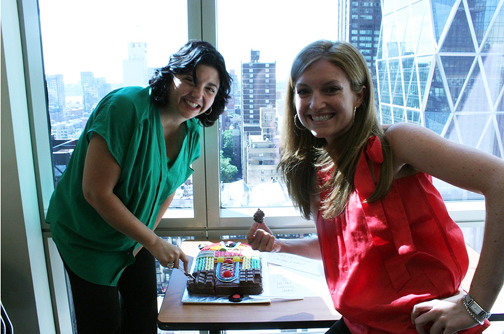 The photo below shows Ashley all smiles with her Jukebox cake and the Marketing Director who was celebrating a birthday on the day of the launch. We can’t think of a better gift! This entry was posted in News and tagged Clarkson Potter Summer 2013 Cookbook Launch, Extreme Cakeovers on August 3, 2013 by Sasha Reichart. Published in the United States by Clarkson Potter/Publishers, an imprint of the Crown Publishing Group, a division of Random House, Inc., New York.